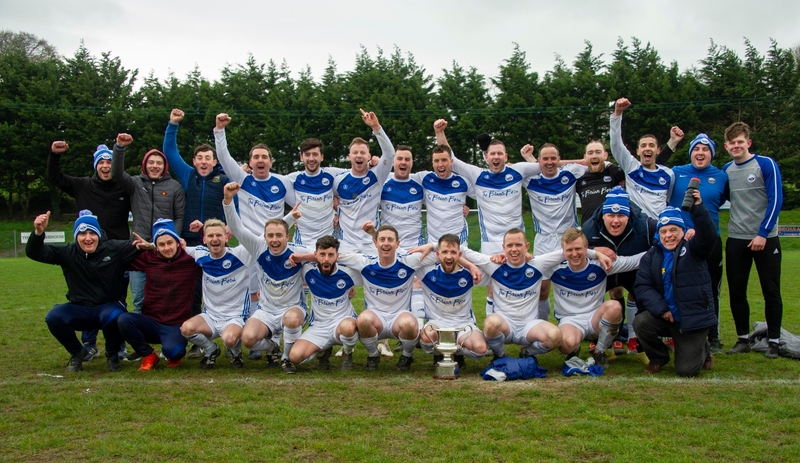 Cashel Town were finally confirmed as the TSDL Division Two champions on Sunday last when they beat their closest rivals all season in a hard-fought 1-0 win over rivals Clonmel Town B in Palmershill. On a bitterly cold day, the first half gave little in the way of chances and it was clear that neither team wanted to give an inch to their opponents. Cashel’s Niall O’Brien and David Butler looked to cause the visitors defence problems while at the other end Ian Clery and Shane Foley looked most likely to break the deadlock. The Clonmel side came out the stronger in the second half and played some great football but the hme defence, who have just conceded three goals all season, stood firm. With 20 minutes remaining the hosts got the luck that all champions wish for as a back pass somehow eluded the Clonmel keeper and rolled into the net much to the delight of the home side. The hosts sat back after this, and soaked up the pressure with Derek Hayes and Ross Doyle proving to be a commanding presence in the middle of the defence, and they helped their side to hold out for that all important win that sees them crowned champions with so far 15 wins out of 15 games. After 15 wins from 15 games Cashel Town are deservedly crowned Clonmel Credit Union Division 2 champions for 2018/2019. End of season games sometimes produce crazy results and there has probably been no crazier a game than this in the TSDL all year. Played in an almost carnival spirit both teams decided to dispense with any semblance of defensive play whatsoever and just give the supporters a show of goals they likely haven’t seen in many a year. The home side opened the scoring early on but Kilmanahan were level within five minutes. After this the hosts took control and scored three more goals before the break. They were pegged back to 4-2 however when Kilmanahan got a second almost on the half time whistle. The second half then looked to be Kilmanahans as they scored three goals without reply to lead by five goals to four with twenty minutes left on the watch. However the home side rallied at hit two more inside the last fourteen minutes for the game to finish with a home win by the odd goal in eleven.